U.S.C.G. Licensed Capt. 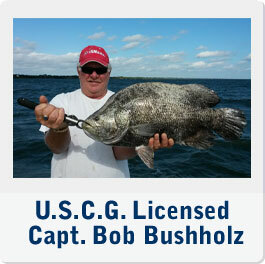 Bob Bushholz has been a resident of the Treasure Coast since 1975 hailing from Brooklyn, N.Y. where his dad first introduced him to fishing in Sheepshead Bay at the ripe age of four. From 1981 to 1993, Bob worked at Grumman Aerospace in Stuart, Fla building Navy F14'S and E2C's. During those 13 years he managed to wear out his first four boats fishing every weekend and some "sick days". In 1994, he left Grumman to start Catch 22 Fishing Charters. The captain noticed the area had several river guides, but no boats could fish more than 3 people at a time. A pontoon boat offers a very large platform and enables Bob to fish up to six people quite comfortably with room to spare. Powered by a Yamaha 200 hp four stroke engine and Minnkota I-Pilot trolling motor. This custom 25'Trident Pontoon moves faster than most others providing more fishing time with a very smooth and stable ride. With 3 coolers, livewell, 16 rod holders, GPS depth finder, 8' Bimini top, 4 swivel seats and 2 bench seats, it's like fishing off your front porch !!! The Stuart area offers quite a selection of species to fish for. Some of the more common ones are snook, trout, redfish, tripletail, flounder, snapper, grouper, ladyfish, pompano, tarpon, spanish mackerel, jacks and more. Check out our photo page for some awesome fish pics. We use light tackle Penn spinning reels on Shakespeare Ugly Sticks while fishing with a combination of live and artificial baits. Feel free to bring your own if you are more comfortable with it. On the day charters, half, 3/4 and full day trips are available up to six people. Night trips are four hours long up to 3 people targeting mainly snook and trout. We supply rod and reel, bait and tackle, fishing licence and ice. You bring food and drink, sunscreen, polorized sunglasses and a camera or recorder. Our sighseeing tours are 4 hours long and good up to 6 people. 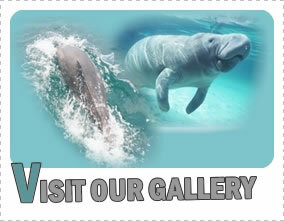 Encounter dolphin and manatee while cruiseing the Indian and St. Lucie rivers, visit Bird Island or tour multi million dollar homes along our waterways. How about landing it at Peck's Lake where right over the sand dune lies miles of prestine undeveloped beaches on the Atlantic Ocean. Captain Bob has logged thousands of hours on the Indian and St. Lucie Rivers and has a knack for finding fish for his clients. He loves meeting new anglers and is great with kids. Regardless of your age or fishing expierience, Capt Bob will make you feel right at home. He takes pride in repeat business with several groups fishing every season for the past 15 years! So make the Stuart area your fishing grounds and Catch 22 your charter in the future.